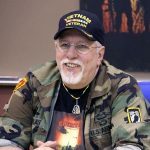 Guest Writer - John Podlaski (The Fog of War) - The Works of Joe Campolo Jr.
A few years ago I attended a Veteran’s event in Michigan where several of us authors of military writings were holding a book signing. I had the privilege of meeting fellow writer and Vietnam War Veteran John Podlaski and his wife. John is the author of the superb book Cherries: A Vietnam War Novel and it’s excellent sequel When Can I Stop Running. Both books offer a very good narrative of the life of a “grunt” during the Vietnam War. John also has a very popular blog on his website. John’s extensive research along with his personal experience as a soldier in the Vietnam War bring these stories to life. I am including the link to John’s blog The Fog of War: The Vietnamese View of the Ia Drang Valley Battle. In my book The Kansas NCO, I quote Robert McNamara who authored the popular statement The Fog of War regarding the mysterious and vagarious nature of warfare. At the same time I am also honoring my close friend, Al Vittori, who fought in that historic engagement.